Pancit Palabok is a Filipino noodle dish of Chinese origin. It is called palabok because the thin rice noodles are covered with a bright colored orange shrimp-flavoured thick sauce. Aside from the sauce, pancit palabok has a toppings of prawns, wedge cut hard-boiled eggs, chicharon (pork cracklings), flaked tinapa (smoke fish), fried garlic and chopped of green onions. Then finished it with squeeze calamansi (Philippine Lemon) all over. Boil water in a pot. Place mongo sprouts in a strainer and then add the noodles. Drop strainer into boiling water. Cook sprouts and noodles until soft. Drain well. Pour noodles with sprouts in a large platter. Prepare palabok sauce: Strain atsuete water. Add to shrimp juice and cook in a saucepan. Disperse flour in water and add to the pan. Bring to a boil and stir constantly. Season to taste. Remove from heat and pour over cooked noodles. Top with pork and tokwa. Sprinkle with tinapa and chicharon. Arrange egg slices and shrimps on top. Garnish with green onions and fried garlic. Serve with kalamansi. 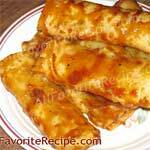 thank you for giving this recipe its makes my day. I’ll try to cook it on my parents B’day. I will let you know!!! I’m going to try this recipe! well detailed and organized. 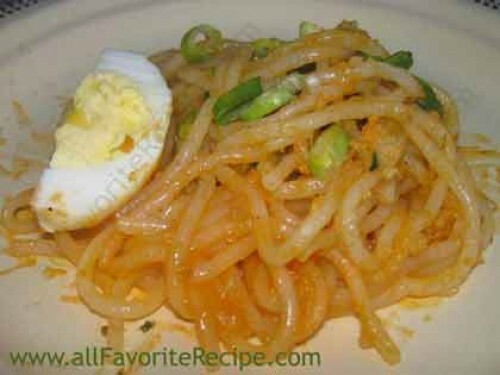 thank you for the post..
when it comes to noodles,palabok is one of my favorite.but i don’t know how to cook it.so i search on the pinoy cooking style, and it gives me some kind of idea how to make it. i relly love to eat palabok though im not expert to cook this!!! pancit palabok is one of my favorute food,this the best di nakakasawa,thanks for sharing this..
I’m not a pinoy, but I like pancit palabok. I would love to try to cook this. Thanks for sharing the recipe. i want to try this… i hope i can cook pancit palabok for some occassions……thanks for the recipes…..
Pancit Palabok is the best ! I love it ! I love palabok so much! Di nakakasawang kainin. Thank you for this recipe. I love Palabok! 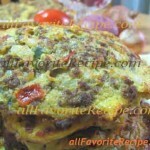 This is a great recipe, so easy and hassle free!